@Victoria Oyama: You are absolutely right, Victoria. Thanks for noting the typo! I think that winnowing basket is ‘mi’ in Japanese, not ‘ki’. A studio portrait of a young basket maker wearing a head band using bamboo to weave a basket. 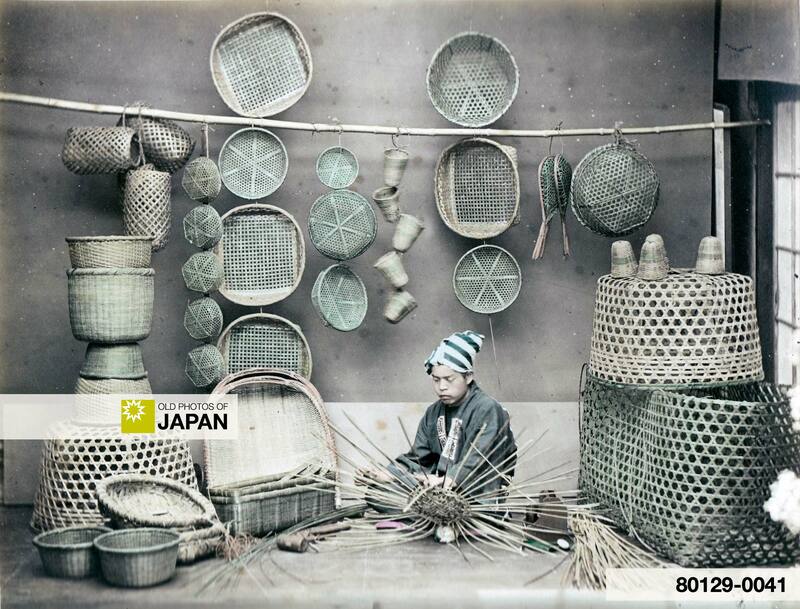 All around him are his bamboo products, which include draining baskets (笊, zaru), winnowing baskets (箕, mi), and noodle-draining baskets (饂飩打ち上げ篭, udon uchiage kago). Many thanks to Noel, who noticed that the props in this image are identical to those of the Yamamoto Studio in Yokohama. This made it possible to both attribute and date this image correctly. See more Yamamoto images at MeijiShowa. You can also licence this image online: 80129-0041 @ MeijiShowa.com. After going through Terry Bennett’s “Photography in Japan” I would say it’s a Yamamoto Studio work. You can see all the similarities in props, especially when you compare it with the photo of woman in kago featured on page 189. @Noel: Excellent observation. I missed that completely, although I have studied Photography in Japan intensively. Will adjust the meta data right away. Thank you!